Hello everyone! Are you dying to see the new studio space as much as we are dying to share it with you? Well, the full scoop is at the ready and we couldn’t be more pleased. 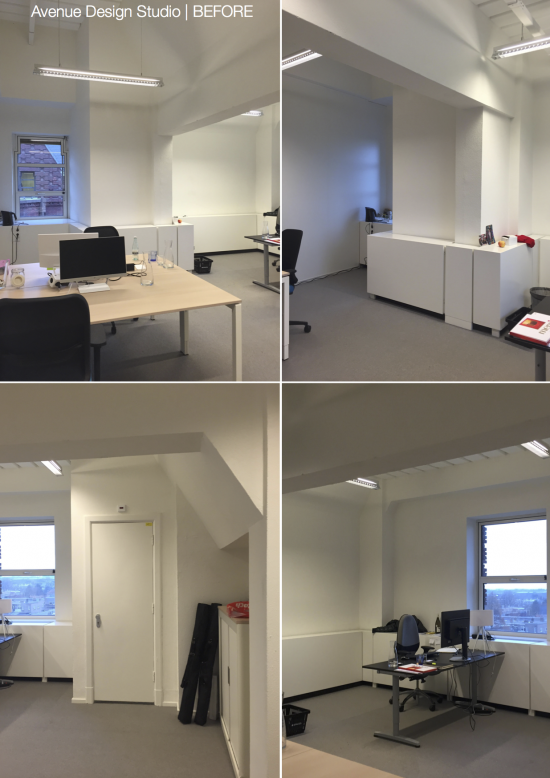 We got the keys on the 1st of January and whipped it into shape in record time so we could get to work as fast as possible, and with as little interruption to our current workload as possible. It took us about two months in total to get it ready to show you guys, and we are so in love with the results. Calm, functional and inspiring was the goal and is very much the result! Love it when a plan comes together. In case you missed it in our partnership announcement a few days ago, the studio is located on the top floor of a beautiful big building in The Hague. The building is majestic and boasts spectacular architecture. It is a former oil company headquarters which now functions as offices and flexible working spaces for professionals from all sectors. 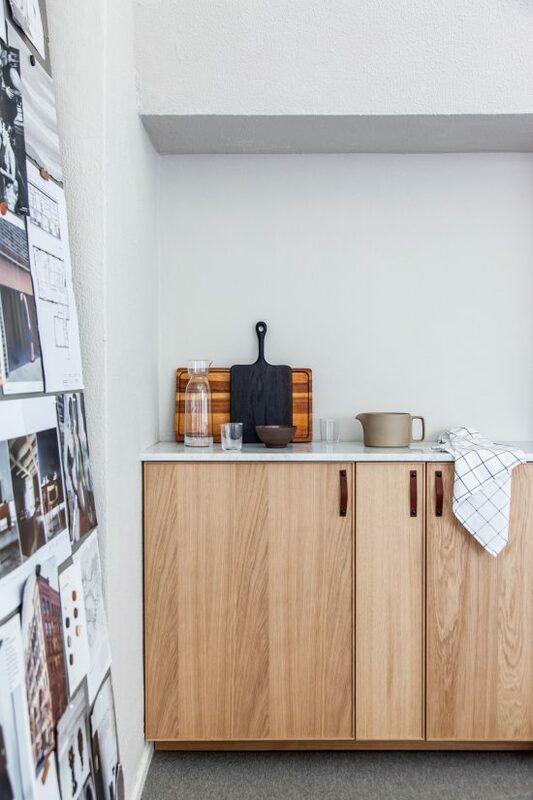 When we were looking to move away from our home studios and into an external studio space, the location was as paramount as the first impression – it had to be practical and pretty in equal measures! 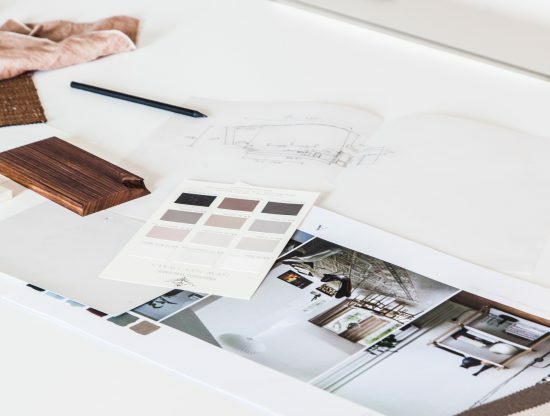 With both boxes securely ticked (the studio is located exactly between both of our houses), and the perfect space secured, we got straight to work with designing the space. Here’s the full scoop, plus a few before and progress shots because we know you love those! The space was very ‘office-y’, as one would expect in a building full of, well, offices. This wasn’t exactly what we were going for but it offered enough room for the two of us, plus two interns, as well as interesting architectural features (high ceilings, nice angles), space for a kitchenette and lots of natural light. 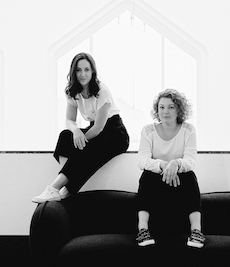 We wanted a space we could quickly transform without too much investment, but we wanted it to be a creative, inspiring space to work in, and above all, reflect us as interior designers. After a shaky initial viewing, we declined the space. We actually nick-named it ‘the pokey office’ because we initially felt it was a bit too small for what we had in mind. I was also unexcited about the lighting, grey carpeting and bulky heating elements against all of the walls, but after we played with the floor plan and went for a second viewing, we concluded that a clever layout, warmer colour scheme and fresh finishes would be enough to transform it into the creative space we were envisioning. 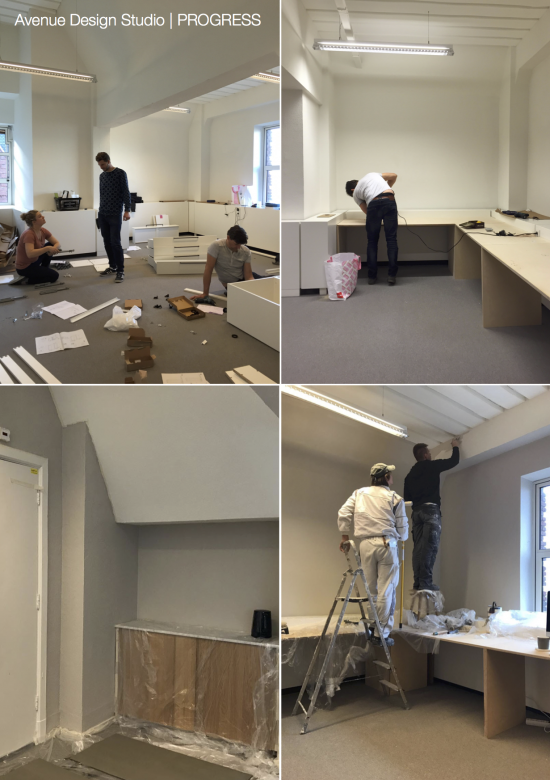 Once we had the keys, we rounded up our (adoring and very capable) husbands and got them in to help us build desks! We created 4 work spaces out of simple multiplex panels that wrap around the studio walls to create openness in the centre of the room and space for a meeting/presentation table. More on the desks below! That first week in January was a blur of Ikea runs, packing car loads of furniture and office supplies, schmoozing our husbands, visits to the building supplies store and in between all that, getting the business end of things in order (bank accounts, official documentation, etc etc etc). Coffee was consumed. Yes it was. More progress shots! These are a shout-out to our interns at the time, Amy and Nina. Having already done a 3 month internship with Avenue, they had been apart of the journey from the get-go, so knowing they would be entering into a very chaotic time with their second internship beginning January, they started the new year rearing to go and excited about the move! They didn’t mind one bit when we put them up to the task of painting the office walls, and also helped out on so many other levels too. We chose the very neutral ‘Purbeck Stone’ by Farrow & Ball for the walls backing the desks and kitchen to add warmth, a slight contrast to the white walls throughout the rest of the space, and highlight the angular architecture. The girls also jumped at the opportunity to create for us a life-sized branding board, which not only inspired us and communicates the brand we are building, it also disguises an unused doorway we felt was letting the team down. 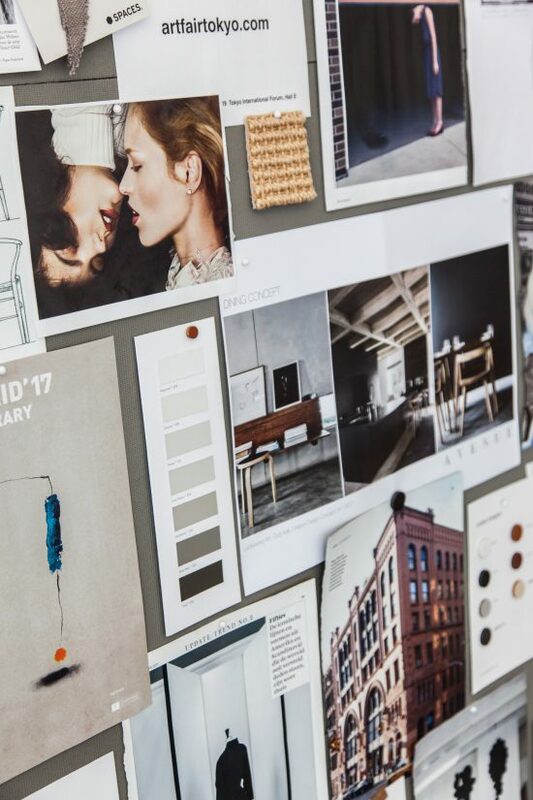 More about the moodboard later, let’s jump to the AFTER’s, wall we? 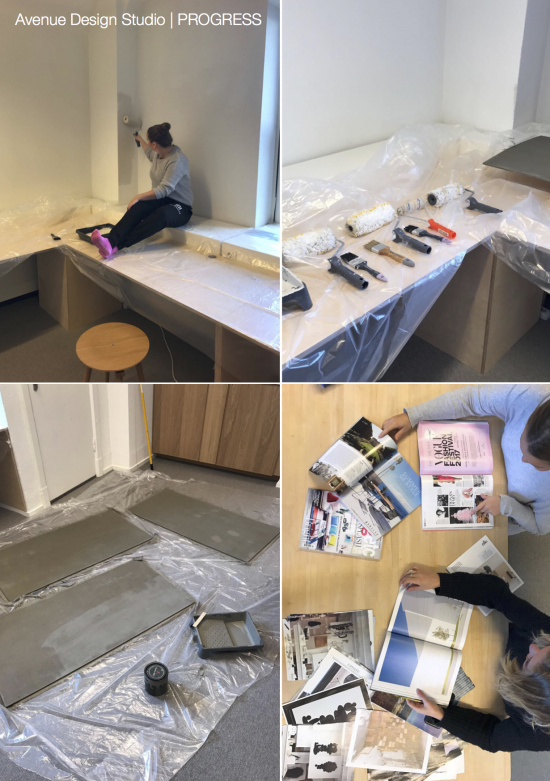 We created our own desks with multiplex the primary material, fashioning 4 work spaces out of simple panels that took a surprising amount of mathematics to pull together, regardless of how much coffee was consumed. We wanted to add warmth to the space, and with the shape of the room and the need to have at least 4 computers, we knew we had to go custom. Well, custom costs money and we wanted to avoid spending a fortune since we weren’t certain we loved the space enough to stay long enough to justify the expense. We concluded that designing/making them ourselves would be the fastest, most cost effective and attractive solution. We wanted simplicity. Minimalism if you will. 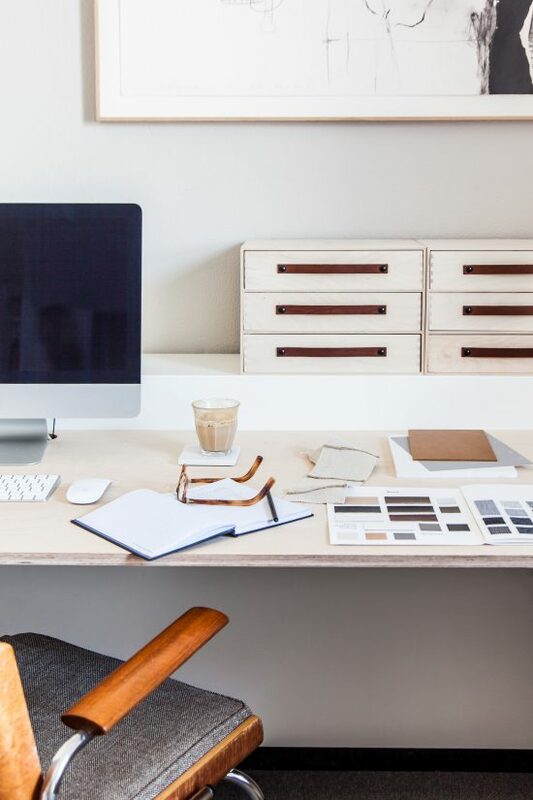 To achieve this we designed the desks out of simple vertical and horizontal panels, the vertical panels on either end offering stability, and the middle most panels forming a box structure to hide cables and support the entire desk. 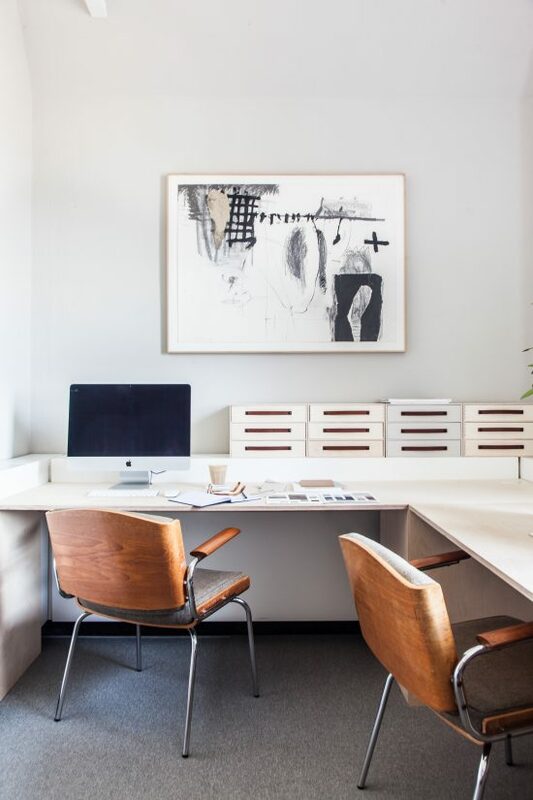 We love the multiplex desk and vintage chair combo very much. Those chairs were the first purchase and the splurge of the studio, sourced at FabriekNL. 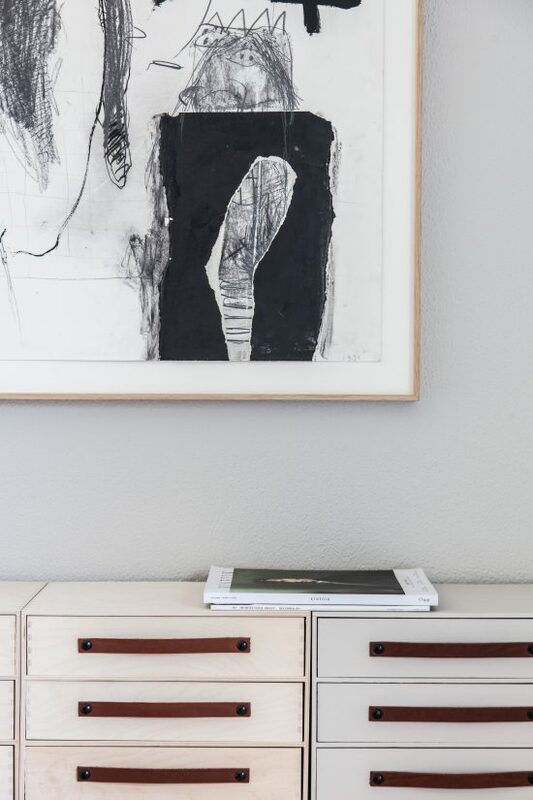 For extra storage above the desk area, and to use the real estate on top of those bulky heating elements against the walls, we added a row of Ikea drawers, finished off with leather pulls from Design Studio Nu. 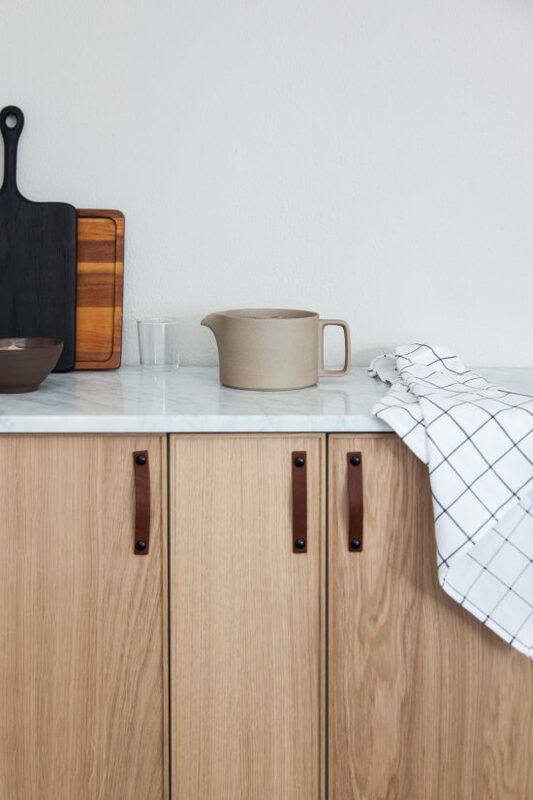 We used a tiny little niche to create a kitchenette, combining Ikea for the base and fronts (the same fronts I used in my own kitchen and like so much) with a slab of marble for the counter. 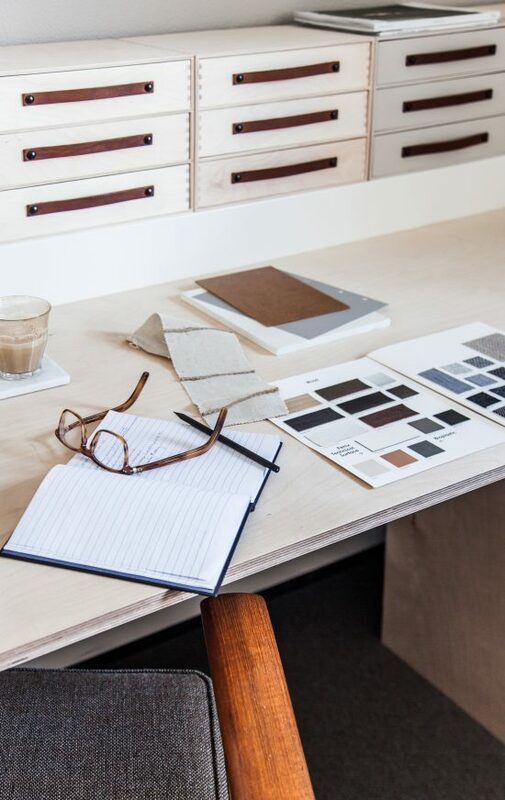 Chestnut leather pulls from our friends at Design Studio Nu were a natural choice to tie in with the desk area. The kitchen accessories you see in this image are from Pantoufle – that teapot though! – except the little chocolate brown ceramic bowl. That one is a July Adrichem piece. 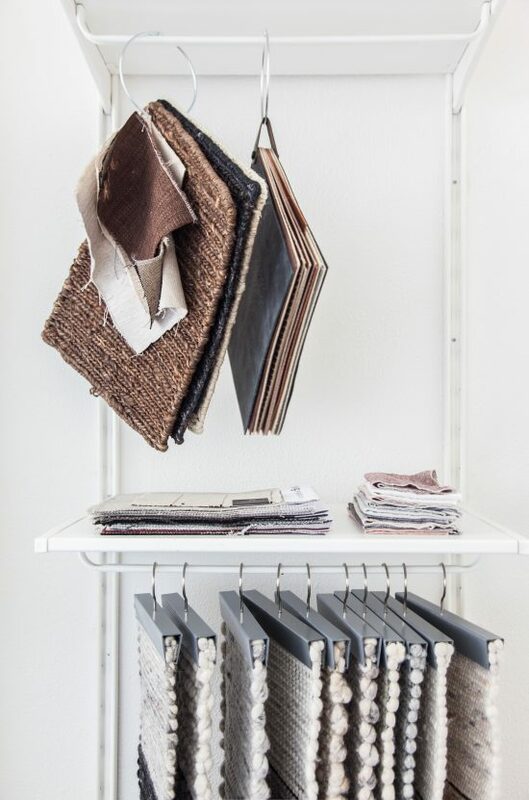 In a nook beside the kitchen and entrance to the studio, we have created a practical storage system for curtain, rug and fabric samples. 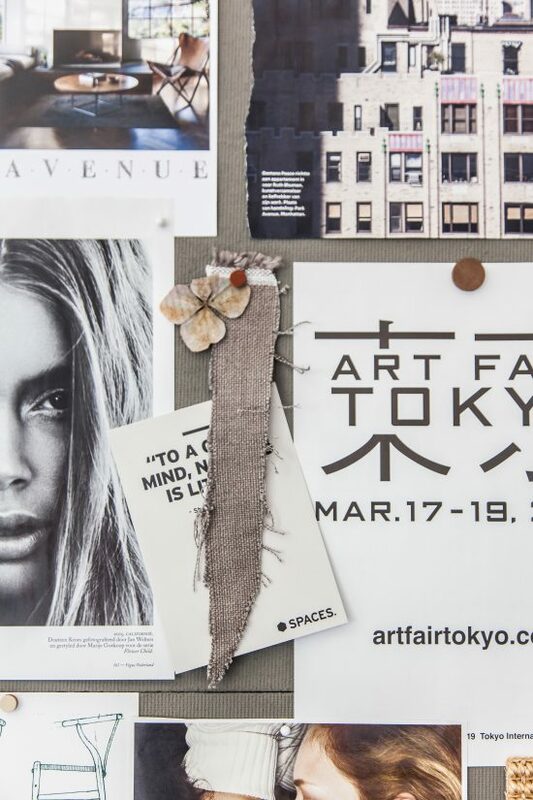 Beyond that is our super-sized branding board, a visual reflection of Avenue as a brand, but also a rotating presentation of clippings and samples that we are currently coveting. We created it using four sheets of particle board attached to a sheet of multiplex, which we painted in Little Greene’s ‘Grey Moss’. It’s the most beautiful, greyed out shade of green ever – we’ve used it in a kitchen of late and just cannot get enough of it! 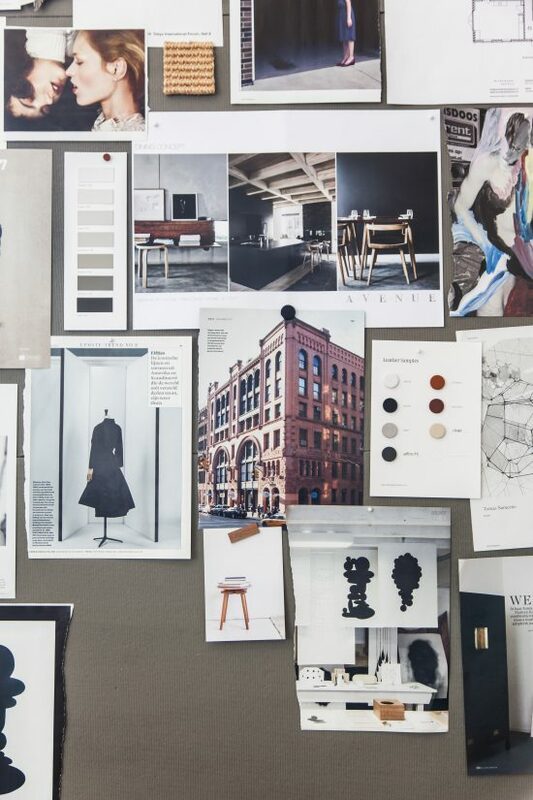 It gives us a warm and contrasting background to the moodboard and allows the images and materials pinned onto it to pop. Look at the progress shots above to see it in the making – that thing soaked up a LOT of paint but it was worth it! In the middle of the space we have a meeting and presentation table, where we also eat lunch together as a team. 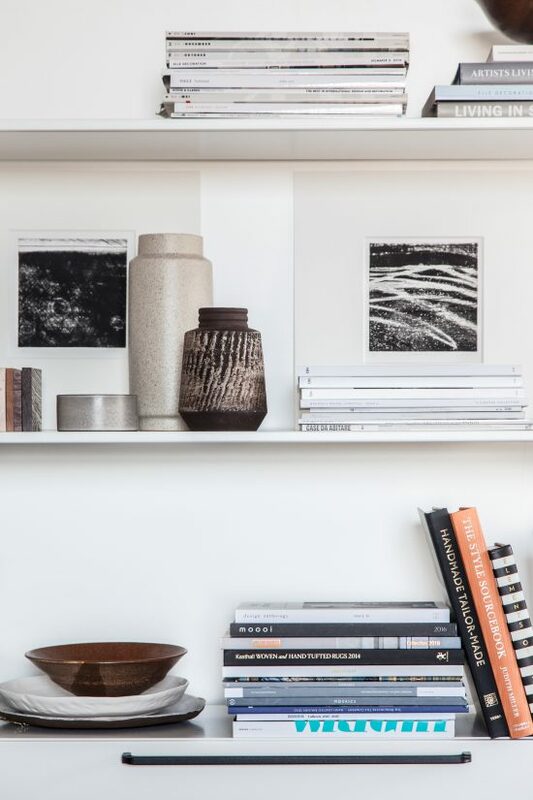 The samples library stores our combined catalogues, interior design books, samples (wood, tiles, materials, carpeting, fabrics etc.) but also houses a rotating collection of props and styling accessories that will eventually make their way into our projects. At the moment we are coveting a collection of custom, hand-turned ceramics from July Adrichem, vintage ceramics from the House of C Shop, various artworks and textiles from my trips to Marrakech. Around the table, we have a set of oak CC stools by Rex Kralj and one beautiful, woven CH23 chair in soaped oak from Carl Hansen & Søn by Hans J. Wagner. So that’s the studio guys! We hope you love it as much as we do and were feeling inspired by the images we took of it. 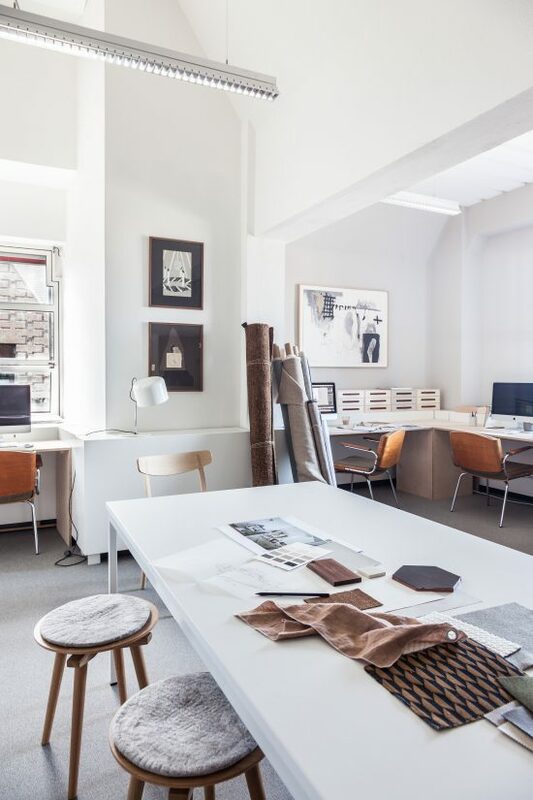 I can’t tell you how wonderful it feels to work in a space like this, with a team of people who are all working towards the same goal – the creation of beautiful interiors. 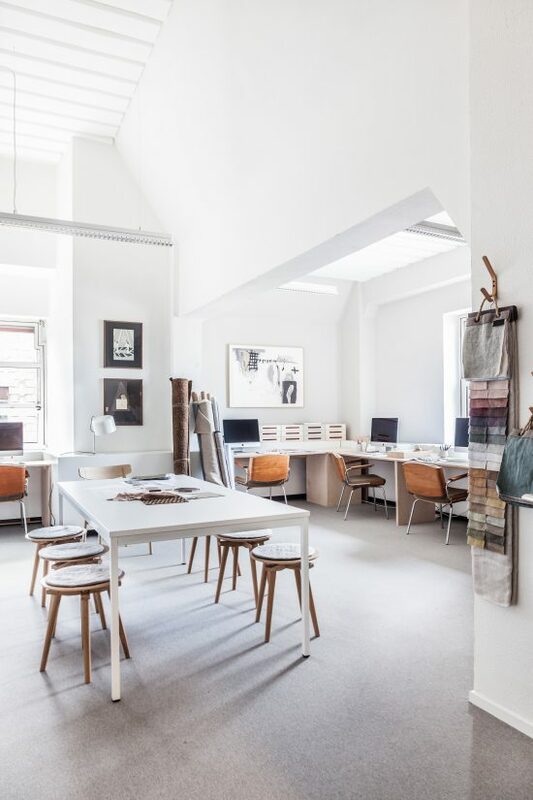 We have an inspiring space out of which to be able to offer our clients a full range of services, from design to photography to product styling. I am deeply proud of what Avenue has become and hope to see it flourish with the steps I/we have taken to get it to this point. 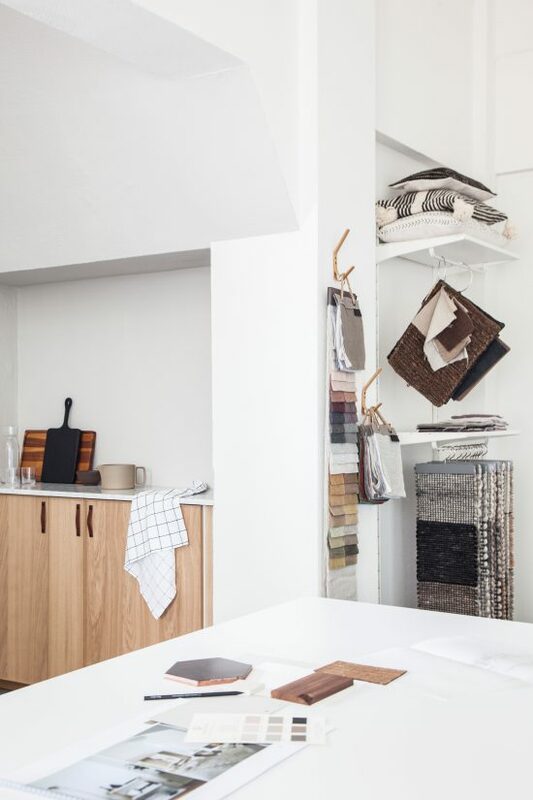 If you are based locally and would like to drop by and take a look, meet us, discuss working together, or peek at our range of accessories, the studio is open on appointment only. Just get in touch with us! Our contact information can be found here. We’ll be back on Monday with a charming interior we recently photographed that has been published and it’s so lovely, you’ll want to move right in! I love what you’ve done and would like to attempt re-creating your mood board. So you took x4 sheets of particle board and glued/nailed them together? I’m not sure what multi plex is but you then nailed/glued that on top? Many thanks. Great! wish you, guys, lots of luck! 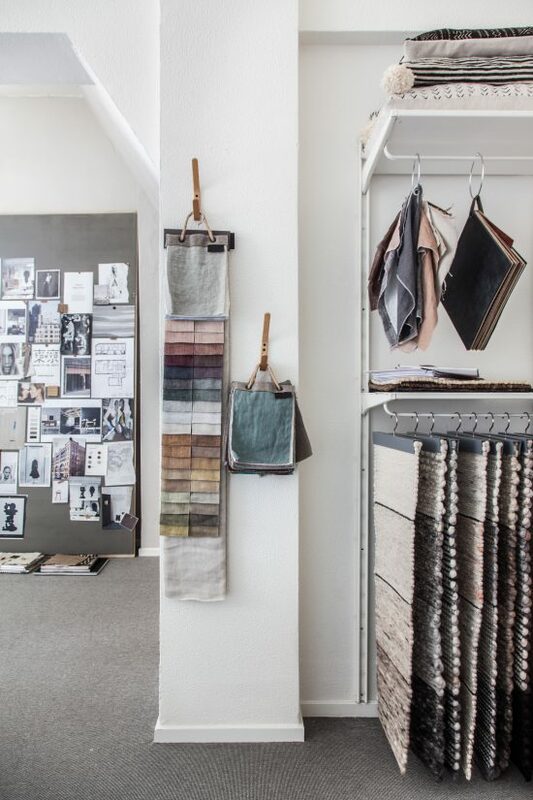 And let the inspiration and creativity be in every cm of your new studio! What a gorgeous and inspirational space! Congrats Holly & Hedda! Looking forward to watching your evolution, and continuing to enjoy your warm and creative style. You did a fabulous job turning this into a workplace that suits you. Where is that large white table from? Thanks for taking the time to write me back – yes, I meant that larger piece. But I actually love all the art including the two smaller black ones. Love your work – keep it up! 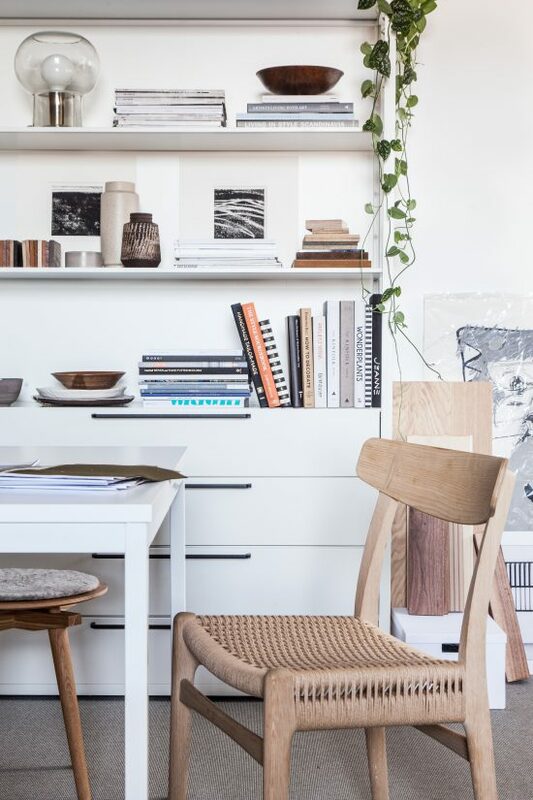 Love the steamed wood office chairs! I love how you transformed the pokey office to your lovely & warm studio! 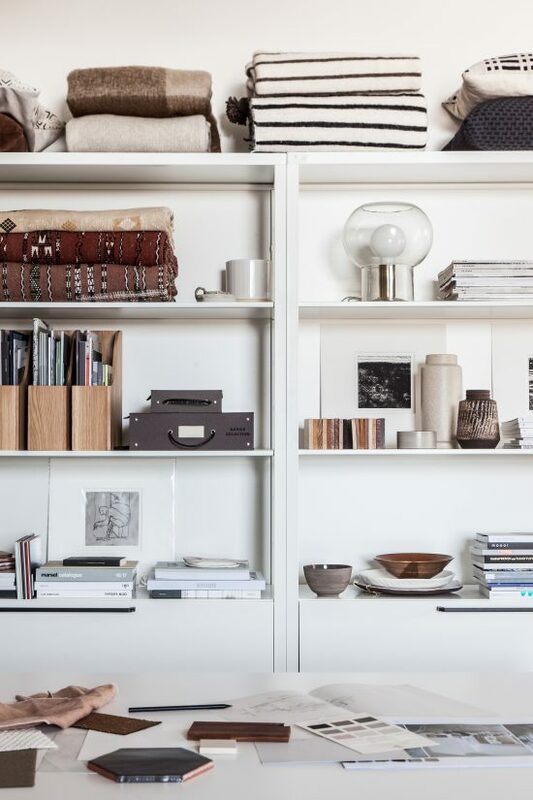 I’m wondering where your wooden magazine cassettes are from, the ones in your white open shelves, with all the catalogues in them.